David Moyo struck twice as Brackley Town hit AFC Telford United for six in Tuesday’s Vanarama National League North clash. Saints took on a Telford outfit which had recorded back-to-back home wins but they were blown away by Kevin Wilkin’s boys who romped to a 6-0 victory. 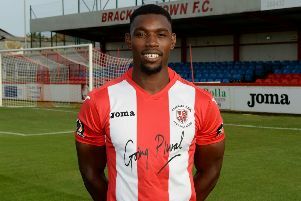 For the second time in three outings Moyo bagged a brace while new signing Jordan Hempenstall, Shane Byrne, James Armson and Glenn Walker also got on the score sheet. Saints took a 15th minute lead when Hempenstall was given time and space in the box before he turned to find the top corner. Boosted by the early goal, Saints twice went close through Moyo and Adam Walker as the visitors moved the ball well on a difficult surface. Telford’s task got more difficult in the 38th minute when Paul McCone got a straight red card after halting Moyo as he burst through the middle. And Saints doubled their advantage from the ensuing free-kick when Byrne’s curling effort beat Callum Burton and nestled in the bottom corner of the net. Saints increased their advantage two minutes after the restart when Armson turned well to see his effort beat Burton via the underside of the bar. Two minutes later, Burton tipped Moyo’s deflected shot on to the bar and Glenn Walker knocked in the rebound. Moyo made it 5-0 in the 65th minute with an excellent strike from 25 yards. And within a minute of the restart Moyo bagged his second goal from Glenn Walker’s cross.